This week I’m thrilled to see my paper ‘Rethinking professional learning for teachers and school leaders’ published in the Journal of Professional Capital and Community. 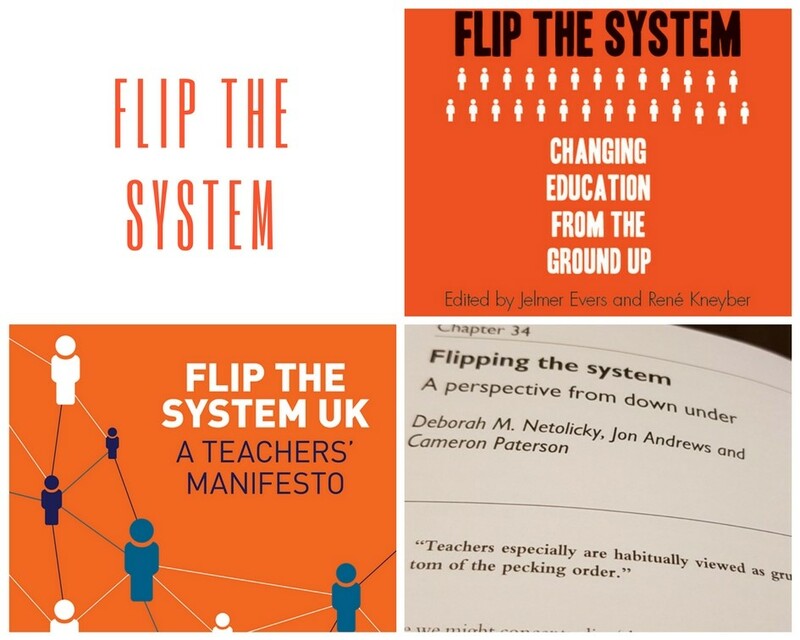 This journal, whose Editor in Chief is Andy Hargreaves, boasts an Editorial Board including Linda Darling-Hammond, Michael Fullan, Alma Harris, Karen Seashore Louis, Pasi Sahlberg, Helen Timperley and Yong Zhao. My paper appears in Volume 1, Issue 4, alongside a theoretical paper by Dennis Shirley. As an early career researcher, I couldn’t ask for more distinguished company. Even more pleasing is that the journal is open access during 2016, so free for anyone to download and read. Open access to the paper means that it can be accessed by practitioners who so often don’t get to read and engage with the literature in (often pay walled) academic journals. In fact, it has already been downloaded (at today’s count) 1689 times. Wow. That’s a bunch more times than my PhD thesis. What professional learning is transformational? My PhD found that transformational learning (as defined by Ellie Drago-Severson, 2009, as that which actively shifts cognition, emotion, and capacity) is: collaborative and individual; occurring in life, school, and work; and requiring elements of support and challenge. Not only was it lifelong, but it was life-wide. For these participants, it is life experiences, as well as professional experiences, that influence their professional beliefs and practices. 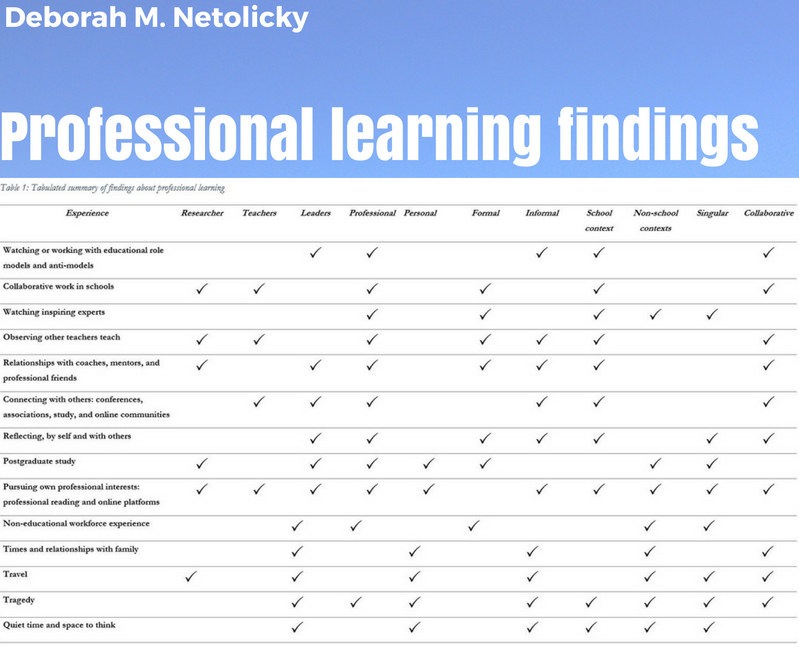 The following is a table, which didn’t make the final cut of the paper, shows the range of features of professional learning found in my study. This table shows the variety of experiences that educators in my study considered transformational for themselves. These experiences included relationships with family members; role models and anti-models of teaching and leadership; post graduate study; difficult life experiences; becoming a parent; and connecting with others at conferences or via social media. It included heutagogical (self-determined) learning, as I outlined for this blog post for the Heutagogy Community of Practice. It also included, especially for leaders operating at an executive level, the time and space for silence, reflection and thinking. The research interviews themselves proved to be spaces of learning for some of the school leaders, who saw them as an opportunity to be listened to intently and to think deeply about their learning and leading. The participants in my study had some important cautions about professional learning and about school interventions. They cautioned that a mandated approach to professional learning, even if differentiated, might not address the needs of all professional learners. They wondered about how to honour the individual teacher and the organisational priorities when leading professional learning in schools. The paper concludes that, while my study intended to explore the ways in which educators’ experiences of professional learning form and transform their senses of professional identity, it found that it is not just professional learning, but life experiences that shape professional identities and practices. That is, our teacher selves and teacher actions are moulded by critical experiences that tangle with and shape our identities, lives, relationships, and emotions. The best professional learning, as suggested by this study, is highly individualised and knottily enmeshed with educators’ senses of self, of who we are professionally. Anyone who teaches knows that we cannot separate our teacher selves from our non-teacher selves. As teachers our lives affect our learning and teaching, and our learning and teaching influences our lives. For many teachers, ‘life’ and ‘work’ are well beyond blurred. We are humans who teach and teachers who exist as humans in the world. The leaders in this study tended to describe themselves as either teachers who lead or as leaders who teach; they remained teachers in their identity self-perceptions. See this post for further musings about the notion of teacher identity, that ‘being a teacher’ stays with many of us beyond our years in the classroom. One suggestion to emerge from this paper is that we would benefit from rethinking what it is that we consider and label as ‘professional learning’. Professional learning is not hours logged on a spreadsheet or entered into an app. It is not necessarily being in a room with other educators at a course or conference that is labelled ‘professional learning’ (although it might be). It is those critical moments across our lives and work that shape the core of who we are, in and out of the classroom and the boardroom. Professional learning can be personal, unexpected, unscheduled, nonlinear, messy, unbounded, and unacknowledged. Can we redefine ‘professional learning’ in more expansive and flexible ways? How might we acknowledge those hours educators spend blogging, or studying, or tweeting, or visiting schools, or collaborating intensively, or volunteering in the service of others? How can leaders lead the learning of teachers in ways that honour their individual learning trajectories and their own agency? How might we rethink our systems and schools in order to focus, not on hours of what is easily labelled or effortlessly deployed (staff day scattergun PD, anyone? ), but on what actually engages us and changes our cognition and our capacities?